Lenses are carefully shaped pieces of glass, plastic, or other transparent material. They are designed to manipulate light rays to create particular kinds of images. For example, the lenses in a telescope are designed to produce an enlarged view of a faraway object. Other common form of lenses are those found in eyeglasses, cameras, and microscopes. Italian scientist Galileo Galilei (1564–1642) and Dutch scientist Antoni van Leeuwenhoek (1632–1723) were among the first to use lenses extensively in scientific research. Other scientists—French mathematician René Descartes (pronounced ren-AY day-KART; 1596–1650) and English scientist Isaac Newton (1642–1727), among others—dedicated most of their lives to improving lens designs. Despite the amount of time it has been in existence, the lens remains one of the simplest and most useful optical tools available. Lenses work on two principles: that light always travels in straight lines, and that it travels more slowly through glass or plastic than it does through air. the middle and thick along the edges. Each design bends and affects light differently. A convex lens bends light toward a central point (see Figure 1a). The farther from the center of the lens a beam of light strikes, the more the resulting light ( f ) is bent. Assuming an object is more than one focal length (a specific distance determined by the construction of the lens) away from the lens, the image viewed through a convex lens is always upside down. This is called a real image, and it can be projected upon a screen. The real image can be smaller or larger than the original object, also depending upon its distance from the lens. Convex lenses magnify or enlarge objects. This type of lens is used in microscopes, telescopes, and binoculars. Concave lenses bend light away from a central axis (see Figure 1b). 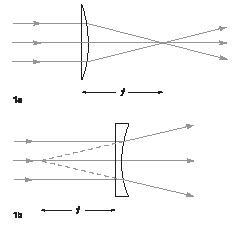 Similar to a convex lens, the light that strikes near the edge of the concave lens is bent more sharply away from the central axis ( f ). The image seen through a concave lens is called a virtual image. It is always right side up and cannot be projected. The virtual image is always smaller than the original, no matter what its distance from the lens. Individual lenses cannot form sharp, flawless images over a wide field, and the images are always accompanied by distortion and color aberrations. Thus, most optical devices use systems of lenses that often assemble convex and concave lenses in precise combinations to minimize distortion or produce various effects. Certain lenses, called plano-concave and plano-convex, are curved on only one side. Optical correction lenses, such as those used in eyeglasses, are ground with one side concave and one convex. Convexo-concave lenses aid patients who are nearsighted, while farsighted patients require concavo-convex lenses.